Cross polarized thin section specimen of NWA 5426. 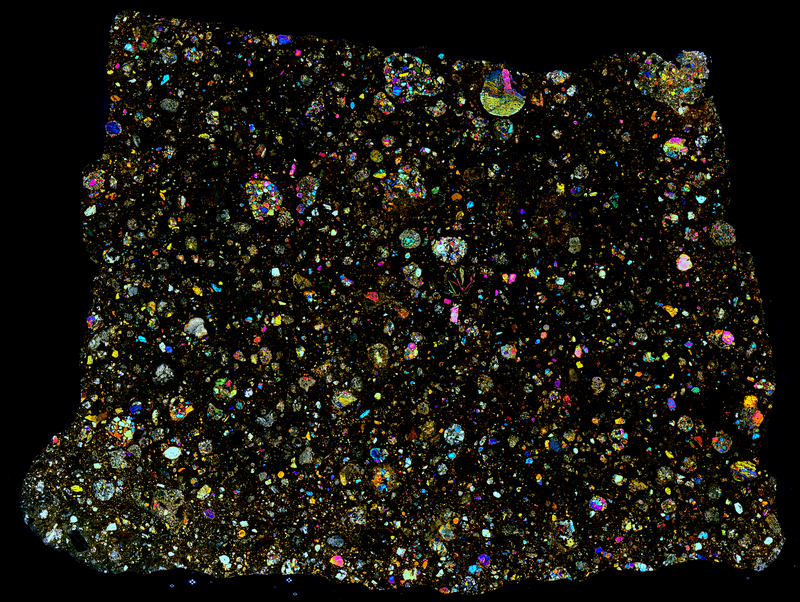 There are two really amazing chondrules you should try to find while viewing the panoramas. NWA 5426 is a R Type Chondrite; “R” symbolizing the type specimen found in Rumuruti, Kenya. According to Norton’s The Cambridge Encyclopedia of Meteorites, these R Type Chondrites are mostly brecciated. In the case of NWA 5426, it is a polymict breccia. Of all the chondrites, R Type Chondrites contain the highest levels of iron oxidation.